Our church had outdoor services in the park last weekend and, as part of that, we were all asked to bring a dish to pass. Since we were stopping by Costco the day before anyway, I decided to just pick up something there (both more convenient and, in most cases, cheaper than making something from scratch). Originally, I had planned on getting a tray of pre-made sandwiches. 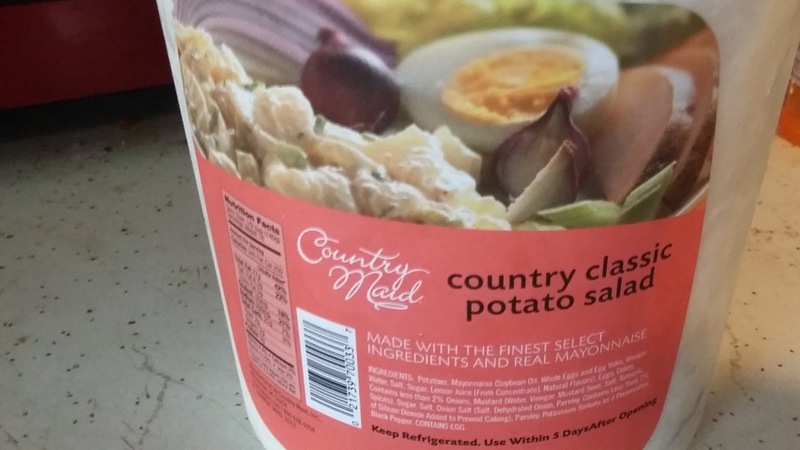 However, as we were passing the refrigerated section, we ended up picking up a container of Country Maid Country Classic Potato Salad. Our decision to do this was based solely on price. The potato salad was just $5.99 (compared to $12.99 for the salads) and the container was large enough for multiple people to have some. As it turns out, however, it wasn't as good of a purchase as we originally thought it would be. I, personally, don't like any kind of potato salad (definitely not my favorite). But, my wife loves it. So, when she doesn't like a particular variety of it, I take her at her word. And, when she tried this potato salad, she hated it. There were a number of factors for this but the main one was she hated how it tasted. She couldn't quite describe it to me, but she thought there was something off about the flavor, either from the ingredients used (possibly the mustard) or just the quality of the ingredients. As a result, she only ended up having a small serving of this potato salad when I'm used to seeing her have seconds. Apparently, she wasn't the only one who thought this either. The potato salad was a complete flop at our church picnic. Very few people even tried it and those who did were making faces that made it pretty obvious they didn't enjoy it. Heck, even the flies (and there were plenty of those) seemed to avoid it. As a result of all of this, we ended up bringing back almost a full container of the potato salad and, after it sat, uneaten, in our fridge for about a week, I finally had to add the rest of it to my compost pile. Considering I really hate wasting food, this was a serious disappointment for me, especially since I spent money on it. I would not recommend this product because of this.